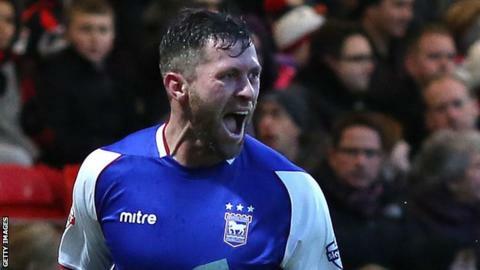 Ipswich Town boss Mick McCarthy has praised the influence of striker Daryl Murphy in propelling his side towards the play-offs. The 31-year-old has carried Town's attacking threat since David McGoldrick injured his knee in February. "Murph has been outstanding," McCarthy told BBC Radio Suffolk. "Since he's been on his own he has been terrific. And he's chipping in with the goals, which he will be judged on. Thirteen is a fantastic return." Irishman Murphy has four goals in six games after scoring in Saturday's 2-1 win over Doncaster and has 13 for the campaign, his highest-ever tally for a season. McGoldrick had been on target 16 times before injury curtailed his season in February. It was feared the loss of Ipswich's top scorer would infringe on their play-off push, but the Portman Road side are only outside of the top six on goal difference, although Reading can go above them should they beat Leicester on Monday. The three points were secured at the weekend by captain Luke Chambers, who made it 15 goals in total scored by the Town back four this season. "Chambo has been outstanding as well. You can see what it means to him and the fans," said McCarthy. "He's been fabulous at right-back even though he's a centre-half. He's done it with such professionalism and has chipped in with goals."